Back to Power Shift: 2018 Midterms index page. The 116th Congress doesn't start for another month, but senators from both parties are already calculating the legislative impact from a renewed focus on climate change that will accompany the incoming House Democratic majority. For Republicans, climate change will factor into negotiations with their House counterparts on a host of issues, including upcoming debates on infrastructure, taxes, spending and defense, not to mention energy and environmental policies. Sen. Jim Inhofe (R-Okla.), the Senate's self-proclaimed leading climate skeptic, said he will be vigilant in his role as Armed Services Committee chairman to prevent costly environmental policies from creeping into the Pentagon's mission. "I would say we've never said anything but the climate changes — it's always changing, it always will change," he told E&E News this week. "We're not going to alter the things that we're doing that are necessary to defend America and America's interests as a result of individuals who are trying to turn this into a policy change for America." Inhofe decried efforts by the Obama administration to "green" the military as an expensive detour from ensuring national security. "We ended up using the military to carry out an environmental agenda, which they did, they did successfully, in terms of distractions," he said. "And so we ended up with billions of dollars in things like the green military and all these things, and we can't allow that to take place because we have enough problems right now. Right now we're in the budget fight for the military." Sen. Roger Wicker (R-Miss. 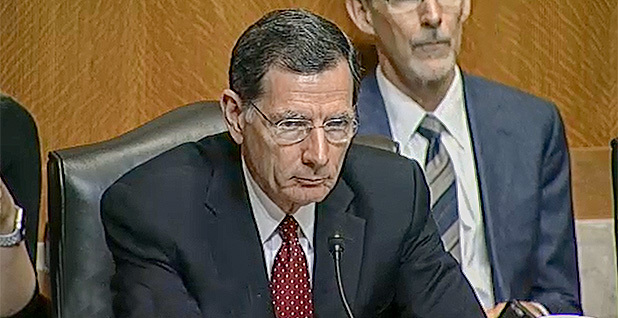 ), who is expected to take the gavel of the Commerce, Science and Transportation Committee, said the Democratic enthusiasm on climate change would be felt primarily on the Environment and Public Works Committee, on which he also serves. But Wicker, whose role on Commerce will give him some jurisdiction over federal fuel economy standards, cast doubt yesterday on established climate science, adding that French protests over the country's new motor fuel taxes should be "instructive" to anyone pushing for comprehensive legislation to address climate change. "I'm just saying I think a lot of Americans may give lip service to doing something because it's been hammered into their heads that there is, in fact, something that can be done to reverse temperature rises," Wicker said. "But when it's translated into reality and you can't drive your car because gas is $7 a gallon, I think the general public in most of the western democracies is going to rise up and revolt." Sen. Bill Cassidy (R-La. ), who has invested a considerable amount of effort in recent years honing his own free-market, pro-manufacturing climate message focused on increased use of cleaner natural gas, said yesterday he intends to take full advantage of the opportunity to engage Democrats (E&E Daily, May 8). When asked about climate change by E&E News as he headed to vote last night, Cassidy coincidentally was carrying a series of printouts of U.S. Energy Information Administration data showing a decrease in CO2 "intensity" per gross domestic product since 2005. "This is going down —- that story needs to be told," he said pointing to the papers. "So absolutely we're going to be looking for that opportunity because really the other side's policies kill jobs. They kill jobs and they drive up energy costs for the average American, directly and indirectly. And we're about preserving those jobs, protecting that family's pocketbooks and continuing policies that have given you this sort of 29 percent decrease in CO2 per GDP since 2005." Cassidy has also been studying the writings of Oren Cass, a senior fellow at the Manhattan Institute who has criticized the conservative push to enact a carbon tax. "Let's just stick it to the American family — drive up costs, drive jobs overseas, hit 'em this way and that way and, by the way, be counterproductive for global greenhouse gas emissions," he said of Democrats' carbon pricing plans. "That's craziness. We're absolutely going to push back on that." Senate Energy and Natural Resources Chairwoman Lisa Murkowski (R-Alaska), who has long expressed concern about the climate change impacts she sees firsthand in her state, said she welcomes the debate. "It's something that I expect to deal with — in fairness, I actually want to," Murkowski told E&E News. "I think that we can be a committee that hopefully can lead a rational conversation on it rather than seeing the extremes on both sides or just kind of the rhetoric." Murkowski, who once backed a bipartisan cap-and-trade bill floated by Senate moderates attempting to steer the climate debate toward middle ground, said she hasn't fleshed out a committee agenda for next year yet. She now opposes regulations for limiting carbon emissions, favoring instead innovation and technology as a solution. "I'd like to try and lead on some of those issues as a committee, but right now we haven't filled out that policy goals list yet," she said. Inhofe also indicated that he would not dismiss climate-friendly policies for the military out of hand, saying he's receptive to measures that boost military readiness even if he disagrees with the underlying science on man-made contribution to climate change. "We say the climate is always changing, and if we have something that's going to happen within that change that is going to be damaging and cause us to try to use that to try to defend America, we would be doing it," he said. Another factor influencing the stage in the Senate is the possible controversial ascension of coal-loving Sen. Joe Manchin (D-W.Va.) to the ranking member slot on the Energy and Natural Resources Committee. Senate Democrats are already facing climate pressure over the possibility. Under fire from environmentalists, Manchin yesterday surprised the Senate by voting against ending debate on the nomination of Bernard McNamee to the Federal Energy Regulatory Commission (E&E News PM, Dec. 5). Although he supported McNamee's nomination in committee, Manchin said in a statement last night that he changed his mind after viewing a video of controversial comments the former Energy Department official made questioning climate change. Manchin's about-face marked the clearest sign yet that he may end up as the ranking member on Energy and Natural Resources, a position expected to be open in the next Congress. Although the current top Democrat on the ENR Committee, Maria Cantwell of Washington, has not announced her intentions, she is widely expected to assume the ranking member position on the Commerce, Science and Transportation Committee next year, given that the panel has jurisdiction over key economic sectors in her state. The three next most senior members of the minority on the panel — Oregon's Ron Wyden, Vermont independent Bernie Sanders and Michigan's Debbie Stabenow — have all indicated they plan to remain as ranking members on other committees. If they stay put, Manchin would be eligible to claim the ranking member slot on Energy. Environmentalists have pressed Sanders and Stabenow to deny Manchin the committee position by claiming it for themselves. Both senators have indicated they won't do so, but they also signaled they plan to press for more climate action in the next Congress. Sanders this week held a high-profile town hall meeting that highlighted the "Green New Deal" that has become a rallying cry for progressives (E&E Daily, Dec. 4). Stabenow told E&E News this week that she intends to stay as the top Democrat on the Agriculture Committee even if the farm bill is completed during the lame-duck session. "There's a lot more to do, including climate change," she said, citing additional work on forestry and conservation she plans to push. "It's about holding carbon in the ground, holding in the trees." Wyden, who will remain as the top Democrat on the Finance Committee, said this week that the recent volume of the National Climate Assessment is a "wake-up call" that will force a discussion on the tax-writing panel on revising the tax code on energy in favor of cleaner sources (E&E Daily, Dec. 5). "I think the last few weeks, this issue has moved to a very different place, and I intend to be heavily involved," Wyden told E&E News. Although major climate legislation won't pass the Republican Senate, a Democratic House could mean more work gets done on climate through appropriations carve-outs and a handful of bipartisan programs, such as carbon capture research at the Department of Energy. Senate Environment and Public Works Committee ranking member Tom Carper (D-Del.) suggested the energy on the House side might push the whole Congress to take smaller steps to address climate change. His priority right now, for instance, is working out a compromise on the Trump administration's proposed freeze of fuel economy standards (see related story). "The one that's staring us right in the face is mobile sources. It's the biggest source of emissions," said Carper, who serves alongside EPW Chairman John Barrasso (R-Wyo.). Sen. Ed Markey (D-Mass. ), a longtime climate hawk who has endorsed New York Democratic Rep.-elect Alexandria Ocasio-Cortez's proposed select climate change committee, said House progressives could help press the climate issue across Capitol Hill. Even simply having hearings and putting climate science in the spotlight can help build support for legislation, said Markey, who led the Select Committee on Energy Independence and Global Warming when he was in the House. "There will be momentum coming out of the House on legislation across the board," Markey said. "I think that it will make it more likely that ultimately we can legislate."